Welding is a very individual thing. You’re alone, under your hood, laying sweet beads on some steel. It’s also pretty personal. You take pride in your welds, want to make sure there are good penetration and appearance. When I think of welding I not only think of the craftsmanship behind the weld but I also let my mind wander into the types of projects that I can do with my skill. I got you covered! Just sit back, relax and read through these projects I hand-picked for you. You’ll have an idea and pictures to save to time and stress. In this article, you’ll get many ideas for different types of projects. Think of this as a list where you can pick and choose the projects that fit you best. Each topic will cover a few projects – and when you find one that rings a bell – click the links to find out more information about that particular project. Now, I handpicked these projects to be easy and simple to put together. You’ll have a great looking completed project done in no time. I like this project because it is super straightforward. You will need 8 horseshoes (which you can easily buy off eBay), a MIG welder and some C clamps. Now in the youtube video, the fabricator uses a stick welder – which you can totally use- but a MIG welder will work just as well. 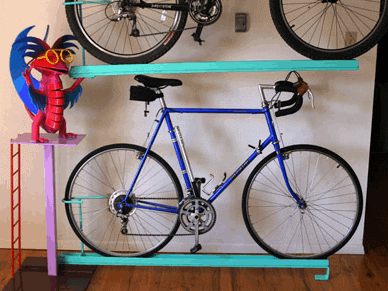 You’ll have a great, unique coat rack built in under 10 minutes. Ok, I do love coat racks and have several in my home. This one is advanced because it requires you to cut your railroad spikes. You will need: as many railroad spikes as you want, and a baseplate to fit your spikes. You’ll trim down your spikes to about 4 inches in length, clean them with a belt sander or an angle grinder, and then use a magnet to hold them on top of your base metal. (I suggest something at least 2″ wide and ⅜” thick. Once you have your spikes lined up, simply drop a weld around all sides of the spike and the baseplate. You can mount it to a piece of solid stock wood or not – your choice! Now this one is super easy and fun to do. You’ll need steel bolts ( or home depot) and a stainless mixing bowl. You take the bolts and line them up face up on the pan in a circle, and start to MIG weld them together. You will probably need a magnet too! Then you have a base, and just keep stacking the bolts next to each other! This project is great because you can use items you already have. You’ll need on a wrench and one chisel. Make sure both are free of any plastic on or around the handle. 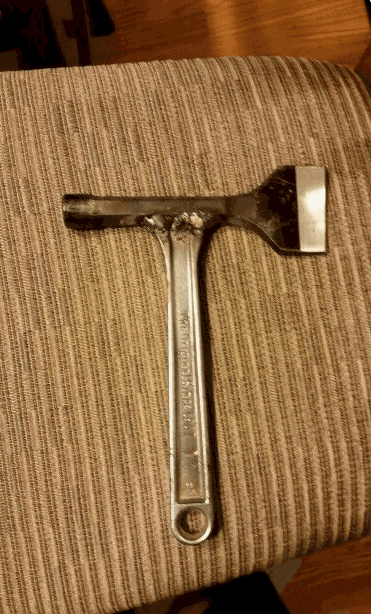 Simply cut your wrench down to size and make sure it fits snugly on a flat surface of the chisel. (A magnet might be helpful.) then simply weld the two together and you have a new chipping hammer! 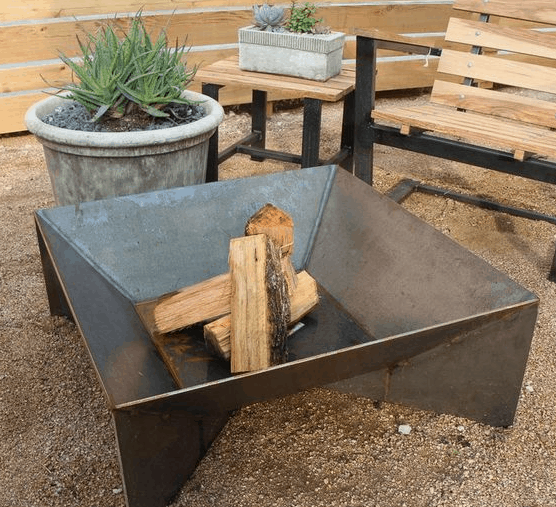 An outdoor fire pit is a great place to gather friends and family. This pit is super easy as it only requires you to cut your steel, friendly your edges with a grinder and then weld it all together. I would use ¼” steel for this project so it really lasts. If you don’t have a plasma cutter, then you can use a cutting disk on your grinder to cut your steel down to size. I love this project because it’s both simple and elegant. All you need is a good length of chain – but make sure you get one that is NOT galvanized. When you weld a galvanized steel a lot of toxic fumes are released. A good used mild steel chain will be rusty but easily cleaned. 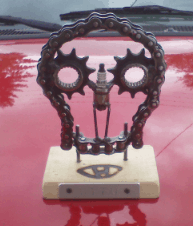 You can then use some c clamps to tack weld your chain into a beautiful design. Coat with some Rust-Oleum and you’ll have a winner. No, this is not made of almonds or walnuts. Rather, here is a fun idea to use some everyday nuts to make a bowl. 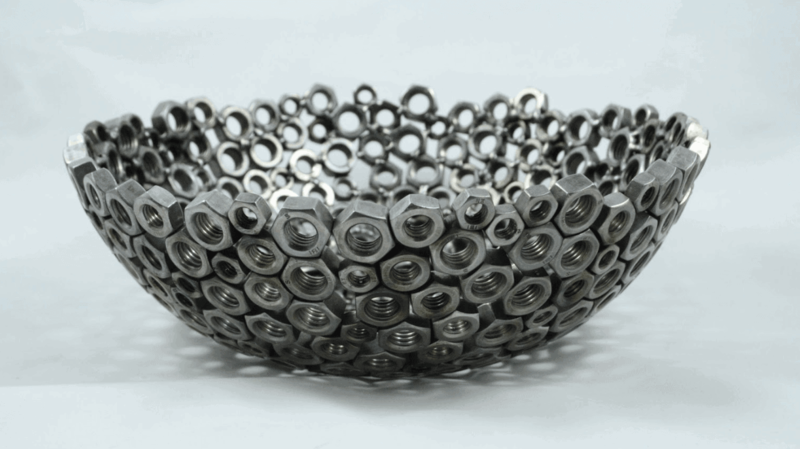 You’ll need a stainless steel bowl to arrange your nuts and a MIG welder. 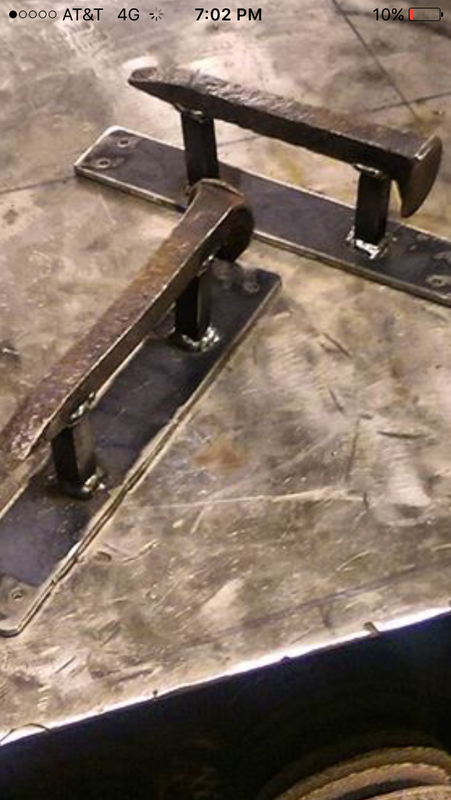 Simply arrange your nuts row by row ( 1 at a time) and tack weld them into place. Once one row is complete, add another – you’ll be done in no time. See my review of the Hobart 140 – it would be great for this project! These will take you no more than 10 minutes to complete and will definitely impress your friends. You’ll need 4 horseshoes, a MIG welder a magnet and a square. 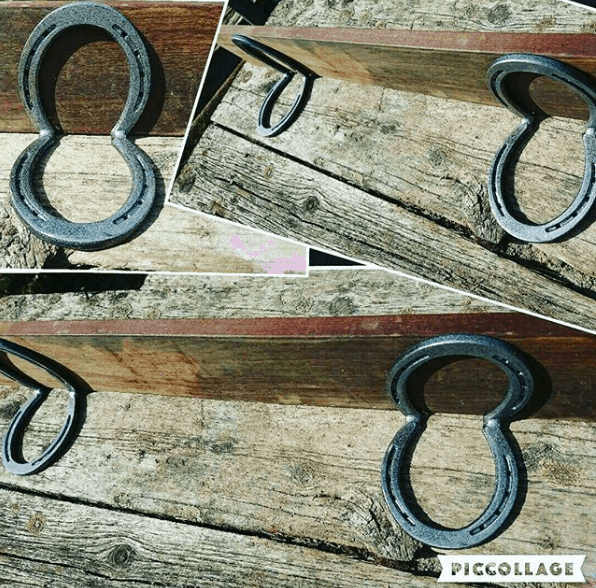 Simply take two horseshoes, used the magnet to hold them at 90 degrees on a flat surface, and drop two welds where the shoes meet. Make a set of two and you have a unique and creative gift. Since we just told you how to make a bracket out of horseshoes in #8, let’s continue the trend. You’ll need a horseshoe and a railroad spike for this project. A square and magnet would be helpful too. Simply rest the spike on the inner flat lip of the horseshoe and drop a weld on the underside of the horseshoe ( where it will mount to the wall). A C clamp might be helpful too. 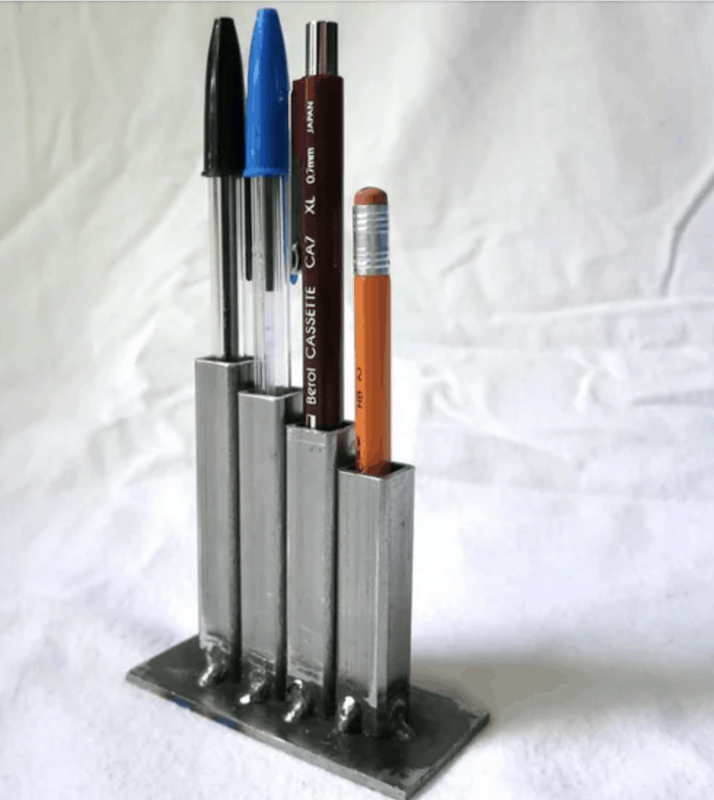 This holder will really set your desk apart from your coworker’s space. 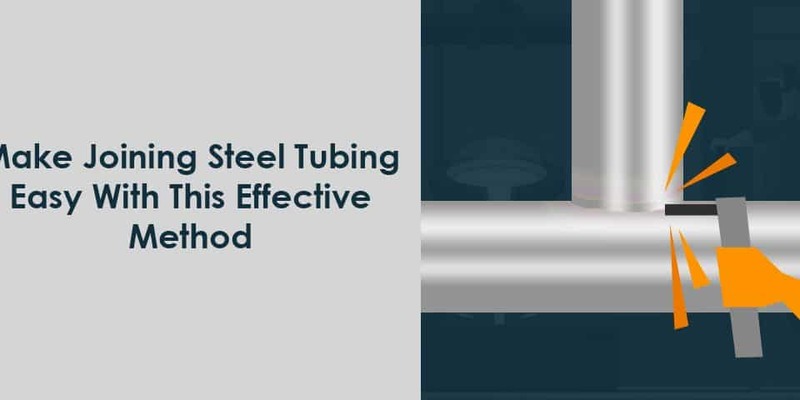 You’ll need different lengths of mild steel tubing. I’ll let you decided what length is best- and you can use either 8 or 16 gauge thickness. Simply cut your tube to length and then run a file or angle grinder ( lightly )over your edges. Hold your tube against a piece of flat bar ( a magnet will help) and tack weld. For added flair, you can spray paint your new desktop accessory with any color rust-oleum. 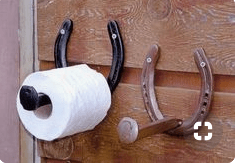 We have another use for our horseshoes once again! You can take three horseshoes and some solid round stock metal and create a very pretty saucepan holder. You’ll take the round stock ( solid metal tube) and cut it down to size. Anywhere between 6-10” in height is good, depending on your preference, and you’ll need three pieces. 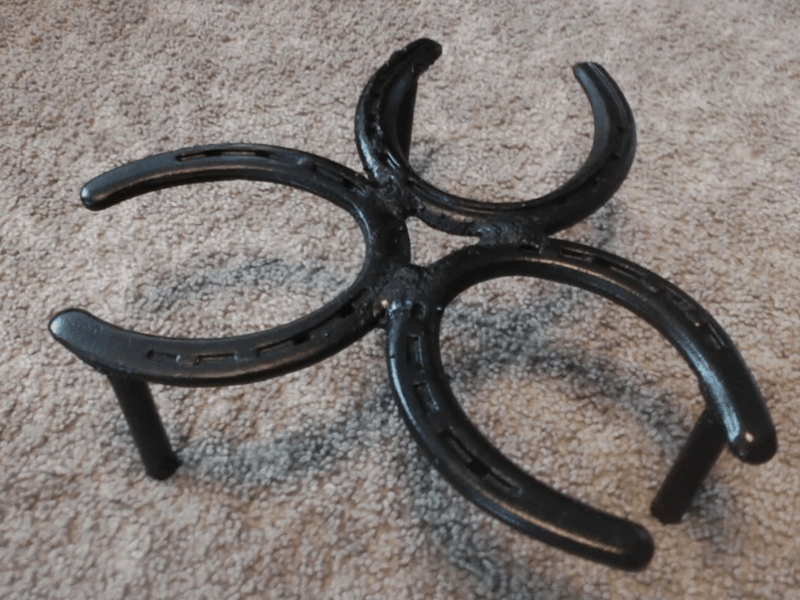 Take the three horseshoes and hold them together with C clamps or magnets, and drop welds on the underside on the shoes so they are not visible. You can then hold the round stock in place with magnets and weld them in place. Finish with the paint of your choice. This is a unique and quick gift that takes no time at all. 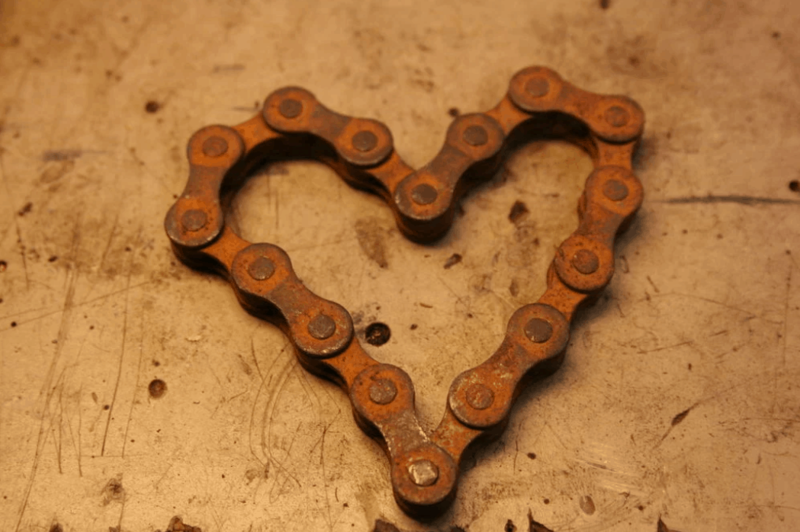 Simply get a used bicycle chain and arrange in a heart shape. I would use some scrap plywood and some nails to outline the heart, then simply come back with your MIG welder and drop tack welds around the chain. That’s a unique gift created in under 10 minutes! Sometimes you want to make some extra cash with your welding skills, and you have a free weekend or two to make something awesome. But you have no idea what to build. Check out these ideas that can make you some extra money. The first project I will suggest is for you. You’ll need a good table in your workspace before you can create something to sell. This table will help keep you organized and efficient. You’ll need some flat steel and some tube steel- but it’s rather straightforward and pretty simple to weld together. Just remember to have a good hood and gloves before you start! This is a really sweet piece you’re sure to love. While you can’t weld up some marble, you can create a beautiful base for the marble to site on top. You’ll need some tube steel for the 4 corners ( 2×2 will work well here) and some 1×3 for the cross brace. If you want to get really fancy you can cut some 1×1 tube steel for decoration and interest on the bottom. This would definitely sell for a pretty penny! Don’t forget to paint it with some good quality paint. I like this idea because it sets you up to make money down the road. I’ll explain: if you fabricate some generic posts and have them in stock, you can use them for tables, chairs, stools, whatever you need. The good part is once the frames are built you can then built whatever your customer wants quickly! 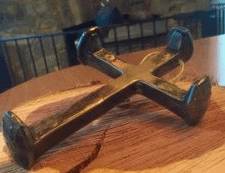 Here is a cool project that makes use of your welding tools with wood. You’ll need a nice slab of wood to work with, and a palm sander for finishing. To make the base you’ll need some tube steel – I would go with 1×3” or thicker – and you’ll cut to size and weld it together. Coat with some high-quality paint and you’ll have a durable solid base for your hand-finished slab of wood. Rebar is cheap, easy to work with, simple to weld and very versatile. 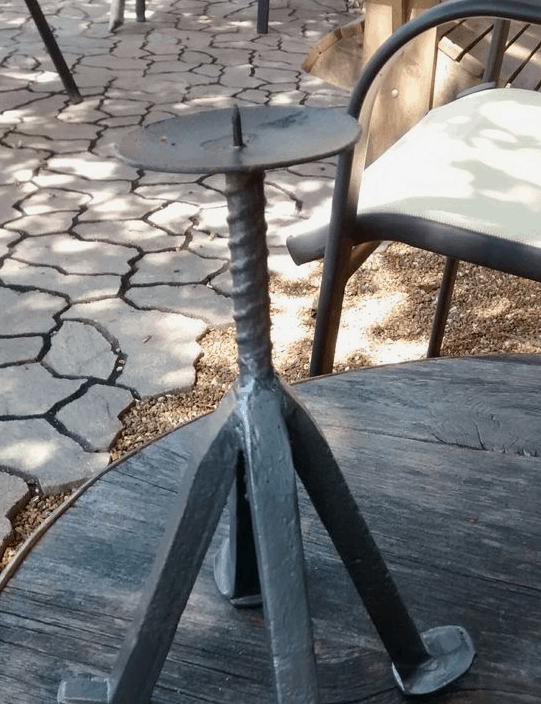 You can create some simple and elegant side tables with a MIG welder. You could also use a blender to create some unique styles as well. Just select the thickness you want to work with and cut to length. MIG weld together and coat with your favorite color and top with the wood of your choice. This project would be an amazing addition to anyone’s backyard. 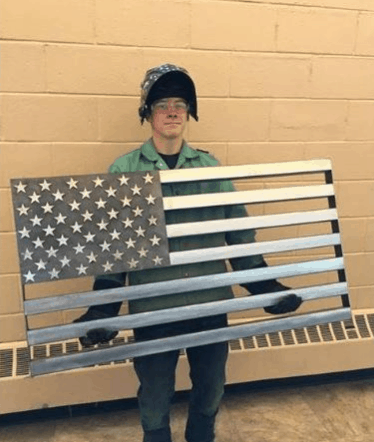 You can create a unique American flag from some flat bar and a small square of steel. You can weld up the flat bar to a base, and for the stars, in the flag, you can simply use a stencil and spray paint them on. Yard art is a great way to make some serious cash. You can source the metal from scrap you already have or purchase leftover pieces from your local welding supply for pennies on the dollar. You can create whatever you imagine, small or large! A plasma cutter would be a good tool to have in addition to your Mig welder, but you can get by with an angle grinder to start. Depending on where you live, this could be a good money maker for you. If you’re in an area that is gun friendly, why not make some simple targets that you can resell to customers who want to practice their skills? You’ll need some mild steel and some chain depending on your setup. These are really easy to make in a few hours depending on the size. This is a unique bench that is welded and uses a wooden top with hidden fasteners. Now in the link below the person uses wood throughout the whole bench. I would make the silver frame from metal – (think 2×2 tubing) so the inside metal is replaceable. That way updating your bench is super easy. Don’t forget the clamps and drill jig! Here is a unique chair that you would be able to sell in a heartbeat. 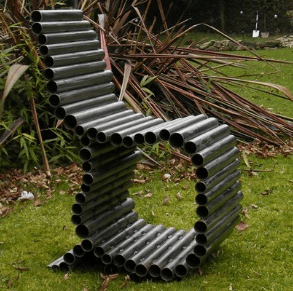 This chair uses regular poles and welds them together. 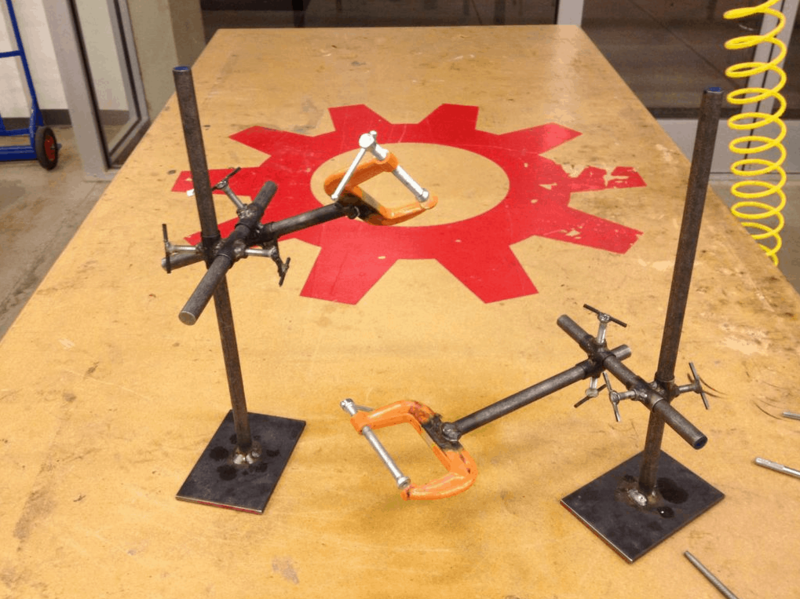 The trick with this project is to weld the chair on its side so the poles are vertical. Once your done tack welding the piece you can paint it any color you (or your client) would like. 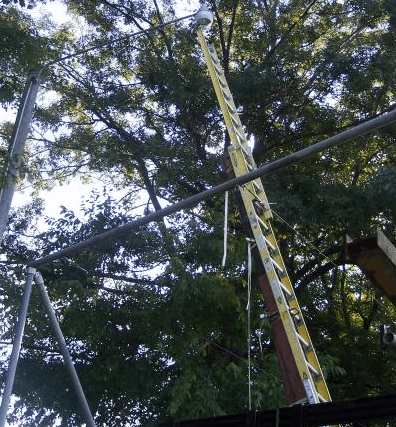 I would go with 1 and ½ pole – it’s pretty standard and would be a good fit for this project. 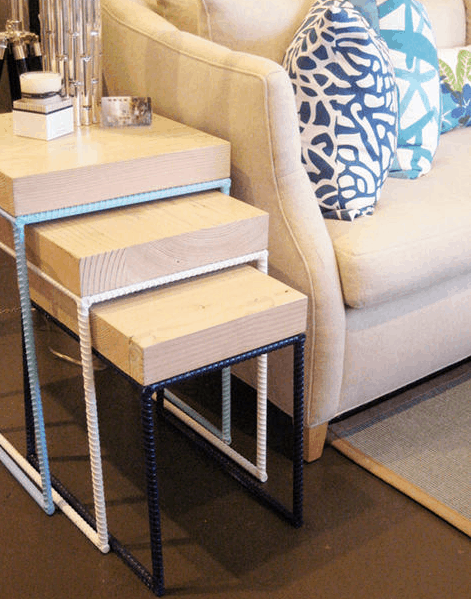 This is a cool idea for a table and would only take an afternoon to built this out. 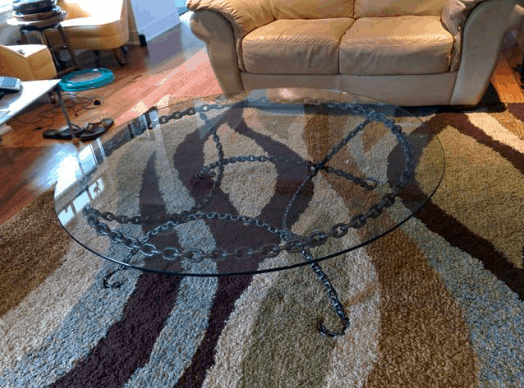 You’ll need some good mild steel chain for this project and a good glass top. The trick to this table it to build it in sections and then weld it all together. I would build out the top first and then the base. Just make sure you are not using a galvanized steel chain. Here is the black paint I would use for the chain. 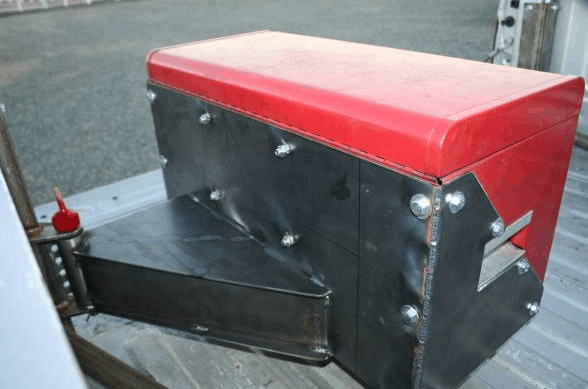 Let’s look at some easy welding projects that you can complete with limited experience weldings. All of these next projects can be completed by a beginner in an afternoon or less. This requires tube steel and some basic tack welding but is sure to impress. You’re neighbor, girlfriend, wife or mother will love this simple and classy addition to the garden. This is also a great project for small gardens and limited space. By building a trellis you’ll add to the amount of gardening space available. Don’t forget the clamps! 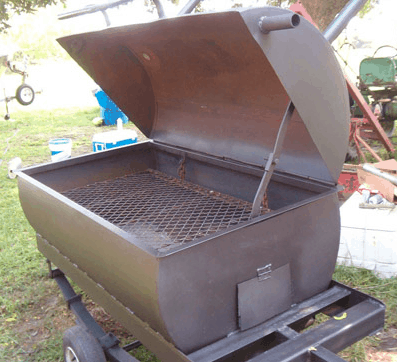 Earlier in this article, we mentioned a nice BBQ you can build. Here we have a great BBQ that is a bit smaller, so if you have limited space or want to take something camping, this would be a good choice. Pick a good MIG welder and you can complete this project in a few hours and it will last you a few years. In fact, check out this review of the Hobart 140 – perfect for this project. This is an easy project that will be super helpful in your shop. Did you ever wish you had your buddy right next to you so he could hold that one piece in place while you weld it? Well, now you have your buddy, and you don’t owe him a beer – ever. These third hands will hold small items in place and help you complete projects faster. You’ll need some steel rod, some plate steel, and some clamps – the rest is pretty straightforward. When you’re beginning to work in a fabrication shop (or anywhere for that matter) safety should be your main concern. That’s why I always recommend a good hood! 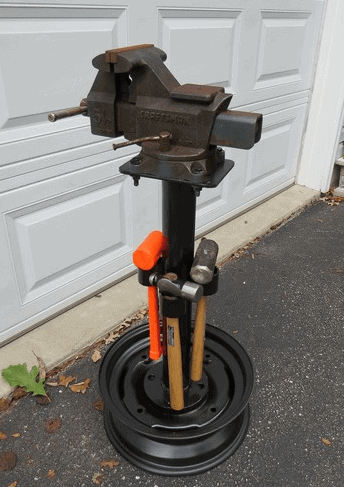 This project makes the angle grinder safer to use because it rests on a stand. I think it’s super clever and easy to build. You’ll use some tube steel, bolts, and nuts – the rest is powered by gravity! 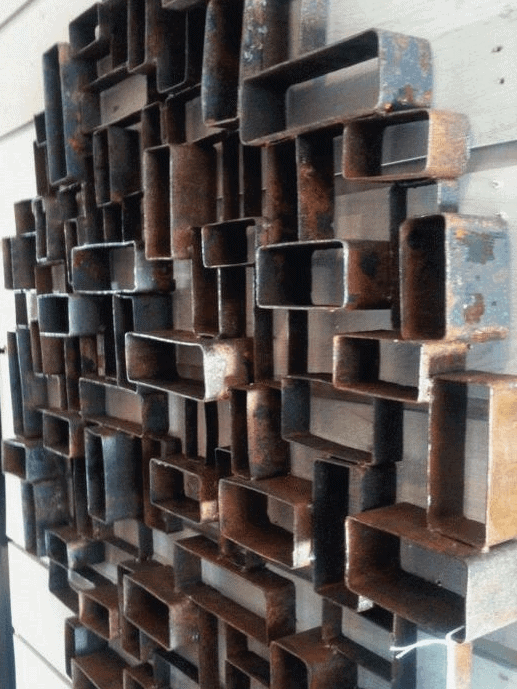 This is a nice project that is not only easy but will add a really nice design element to your home. You can make it as simple or as elegant as you like. If you want to add some curves to your metal, don’t forget a bender would be really helpful to have. 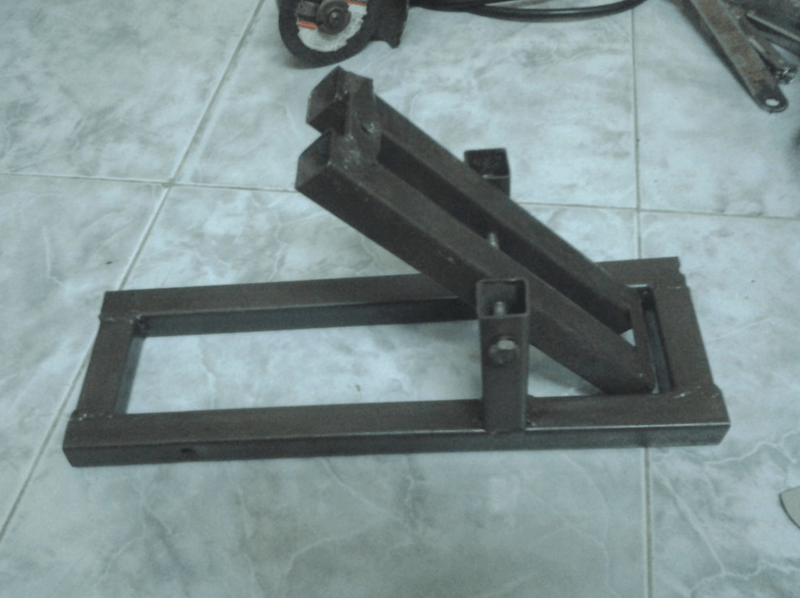 You’ll need some solid stock steel to bend and some plate steel to weld it to for a heavy base. Here is something quick and easy you can make in about 15 minutes. You’ll need some horseshoes and some mild steel flat bar. 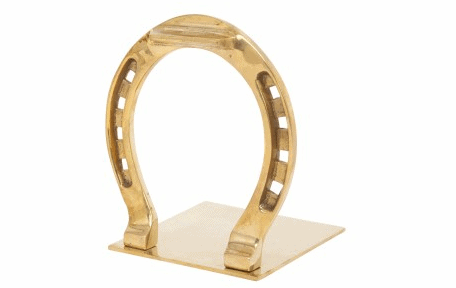 You’ll simply use a magnet to align the horseshoe and the flat bar to a 90-degree angle and then drop a quick tack weld. Finish in the color of your choice. 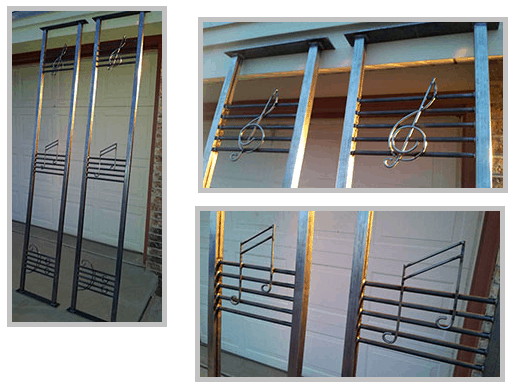 Check out these musically inspired roof supports. They are perfect for the music lover because they add a simple design element that lets another know what you appreciate. These are simple to create and would be very easy to sell. These were constructed with some tube steel, flat plate, and some solid stock. To make a note you can either cut and weld them together or use a bender. I’ve always been a fan of ham radio, and here is a project that will extend your reach. 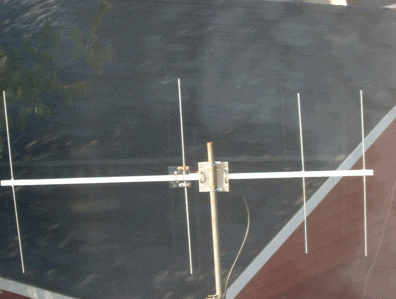 This antenna was made out of aluminum, so you’ll need a welder that can weld aluminum. The rest is pretty straightforward, just make sure you create a way to attach your antenna to a solid base. Gates are a simple project that can really easy to make and could also make you some money if you want to start a side business. 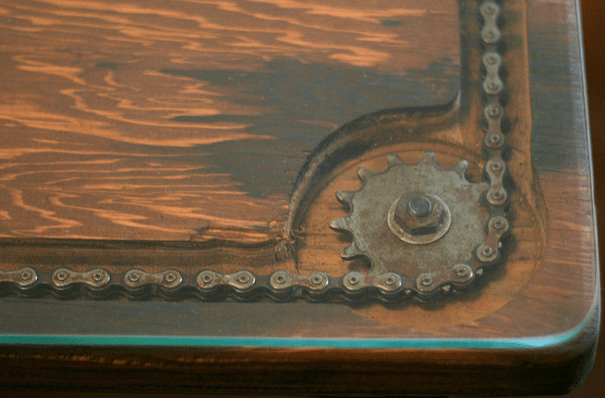 If you’re going to make several of the same gates, consider making a jig of plywood – that way you have a repeatable way to produce the same item, over and over. 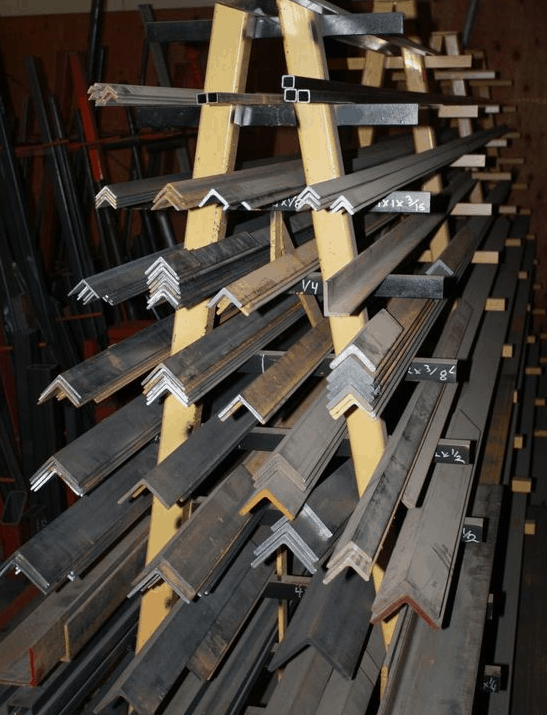 You can use either tube steel or solid stock, depending on how heavy you want your finished gates to be. To prevent rust, always use good paint! This is a really simple project that would make a great gift or just add some decoration to your own bookshelf. You’ll need some old wrenches cut down to size – (use an angle grinder) and a good baseplate – I recommend some nice ½ stock. Once the wrenches are cut down to the size you can just weld them in place. 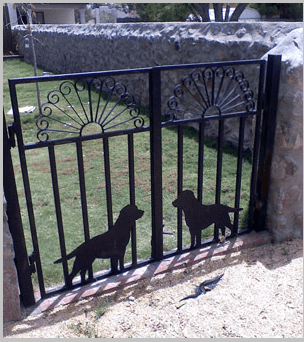 Similar to our gates, security bars are really easy to make and can be produced simply in a jig over and over and over again. 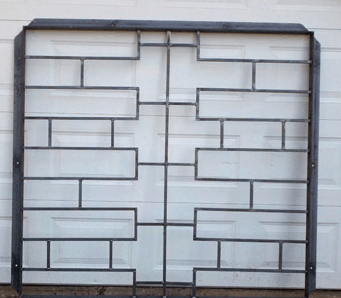 You can make them out of solid stock (recommended) or tube steel for a lighter weight window covering. The angle grinder holder from #28 would be really helpful here! 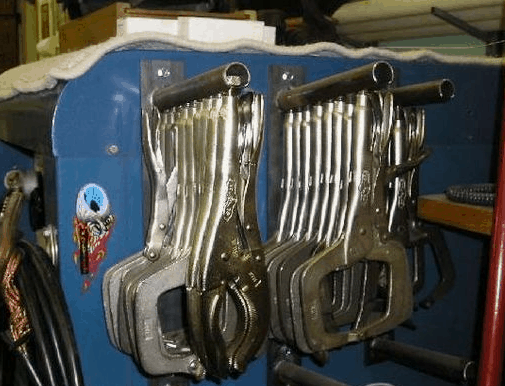 If you welder or know someone who welds, they have plenty of vice grips and c clamps they need to store. Here is a simple and easy project that will help keep your ( or your buddies ) shop well organized! If you’re in high school your probably just learning how to weld. This is a great time to have a mix of simple projects and projects that also challenge you to become a better welder. If you’re just learning to weld you’ll definitely need a place to store all your stock metal. This would be a great time to make a rack to hold your material. You can make one as big or as small as you need it. A simple MIG welder will do the trick in no time. Maybe you want to start with a small easy project to get comfortable welding. This is a great project for a beginner with limited skill. 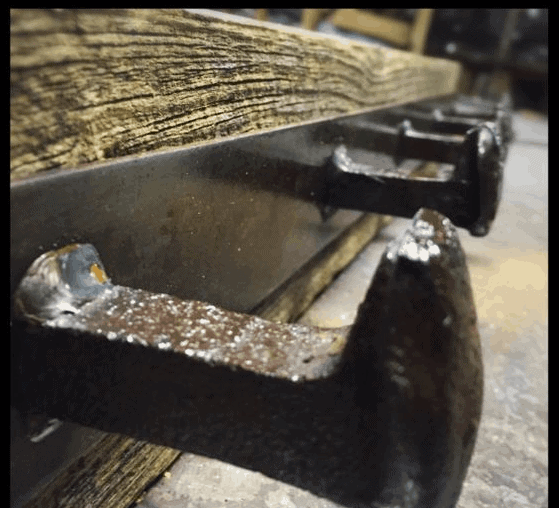 You simply line up your bolts and tack weld them into the shape you want. This project could not be easier and will build confidence quickly. This is a simple project that will only take an hour or so to complete. Now, you can use a kiln to heat your railroad spike and bend it into shape, or a bender and a small propane torch to heat your spike. I would go with a small bender. If you don’t have one on hand a torch and hammer will work too! Maybe you want to make a nice gift for a special someone or just create a unique conversation piece for your home or yard. 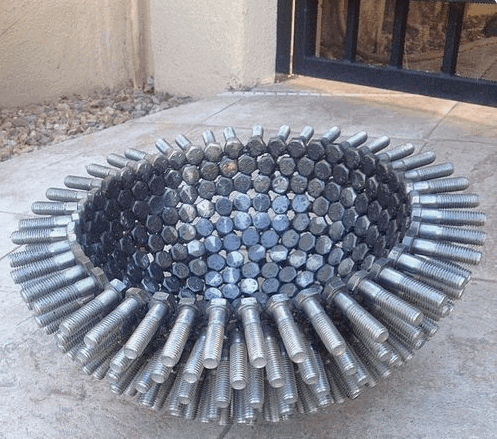 A candle holder made of railroad spikes and rebar is easy to make and will last you for years. Use any color you like to prevent rust! This is a nice little project that you can do over a weekend that is not only decorative but is also a sign of your faith. You’ll need to cut down 4 railroad spikes with an angle grinder and then use a magnet to keep them in place while you MIG weld them. This is a nice piece of artwork for indoor or outdoor use! We covered a simple welding table in #13, but what if you just don’t have the space to dedicate to a full table? Well, I got you covered. If you construct a good frame, you can fit other items in and around the frame to maximize space. That way, when you need a table you can just take this one out and place a wood slab ( or metal) on top and you’re ready to get to work! This requires only some simple tube steel and some MIG welds. If you’re in high school maybe your not able to drive a car just yet. That’s ok, why not make a nice storage area for your bicycle? 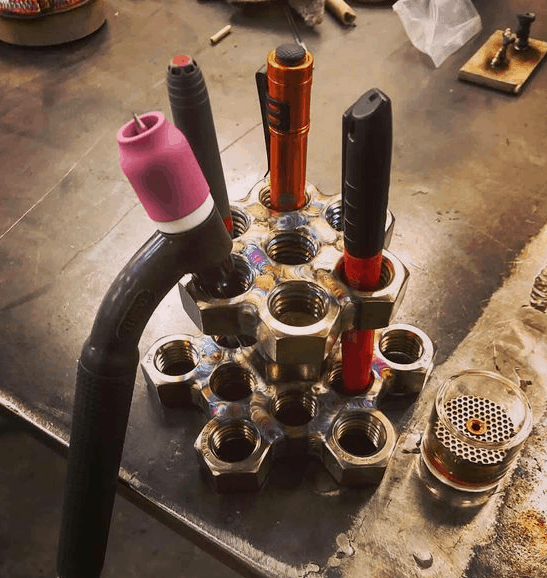 This is a fun way to save space and practice your new welding skills. Also a great idea for urban dwellers who want to maximize their apartment space! If you ride a motorcycle then you know how frustrating it can be to have just the right space for your helmet and coat. 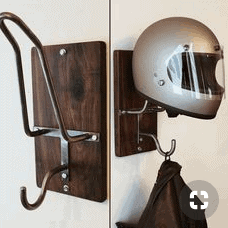 This rack is a really nice way to store your helmet and coat until your next ride. 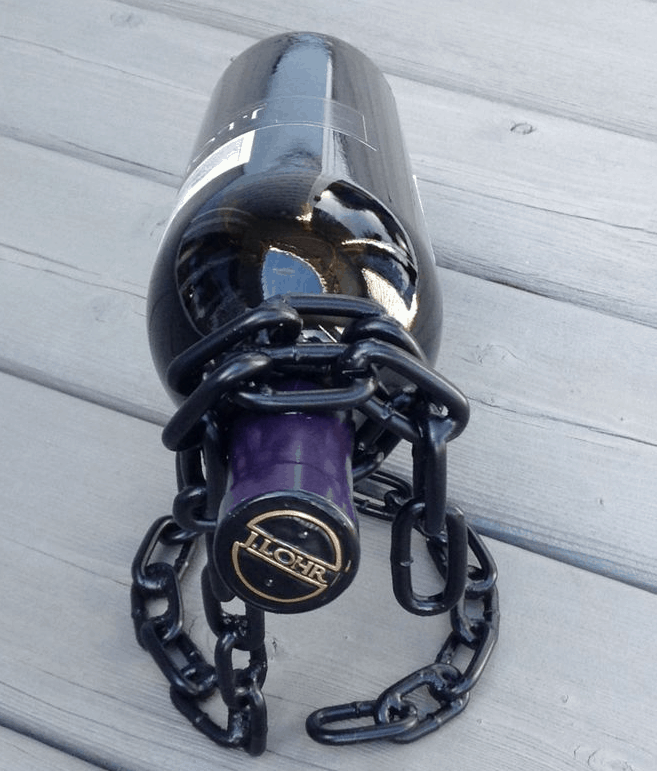 I would definitely invest in a bender for this – it will make the project so much easier! If you’re learning to weld in high school you might also be taking an automotive class too. Why not make a car creeper that will be much better ( and cooler!) than the standard ones you can buy? You can make one out of aluminum or steel, whichever you choose to make sure you have the right gear. 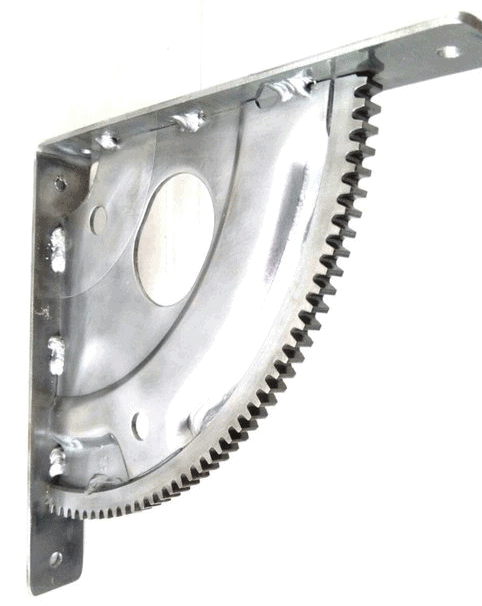 An aluminum creeper will require an aluminum attachment to your MIG welder. When working with a vice you want to make sure it’s stable and you have all your tools in reach. 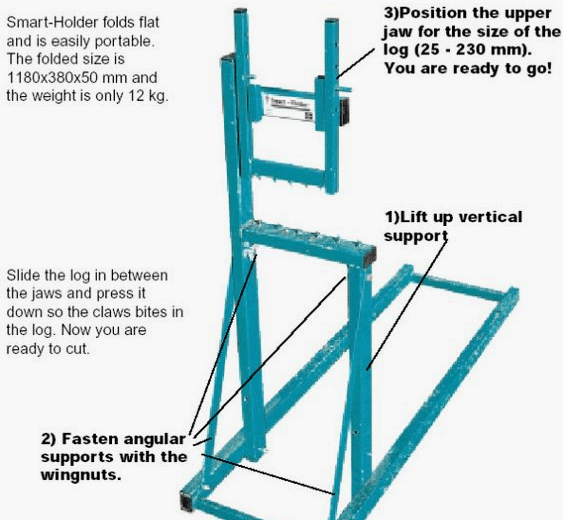 This is a good project to make a stand that’s portable and is separate from your workbench. This is pretty simple to MIG weld and you can move it around your shop or garage as needed. Here are some good wheels you could plug weld to the bottom of your stand to make it easy to move. 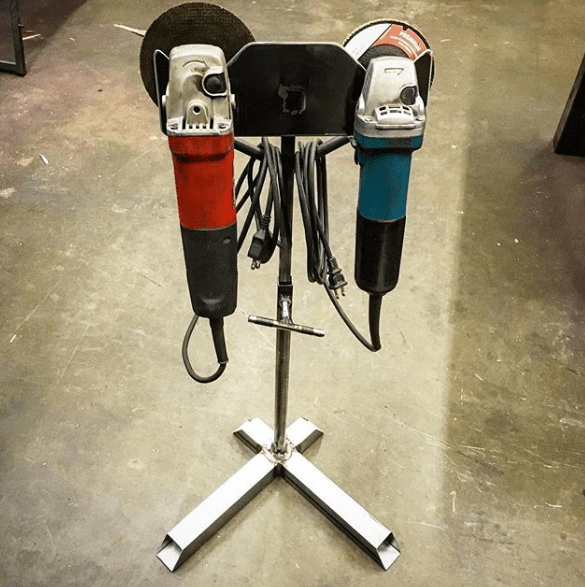 Since we are talking all about stands, why not make one just for your angle grinders? In high school you’re learning all about the different tools you will be used in metalworking, and the angle grinder is always being used! Keep yourself organized with a dedicated stand that’s simple to make. What I love about these brackets is they are really cool to look at, super functional and really easy to fabricate. You can get some old gears from your automotive shop and then cut them down to size. Clean them up and you can weld them onto some 90 degrees bent flat bar. 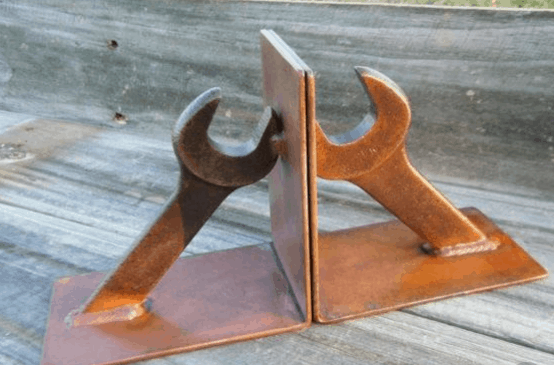 ( use a magnet to hold the gear while you weld) You’ll have brackets for shelves, tables or basically anything you can think of requiring support. Here are some great ideas for projects around the farm. These projects are practical, useful and easy to construct. They will not only save you some cash when you make them, you can make them to the specifications that best suit your farm! Here are some ideas for a good truck hoist. You’re always moving items in and out of your pick up, so why not make it easier for you? The best one I found took a harbor freight hoist and then cut it down to size, welding and bolting the hoist into the truck bed. 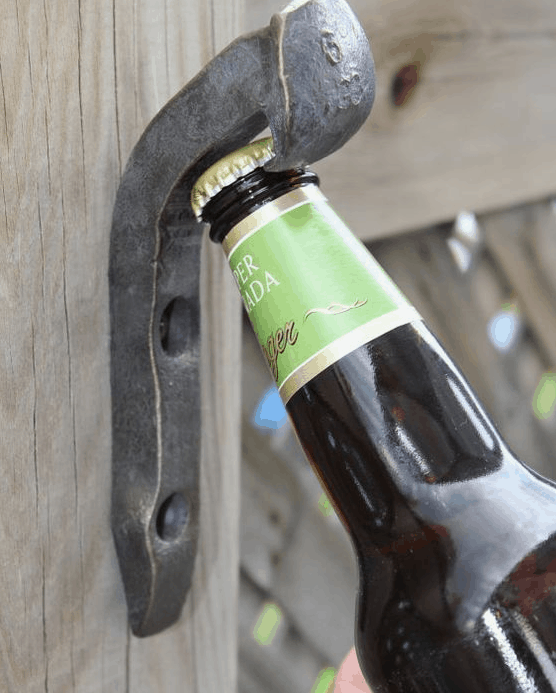 Here is a great way to repurpose some railroad spikes and make some heavy duty barn door handles that will last a lifetime. You’ll need some railroad spikes, some flat bar, and some round stock. Cut your round stock down to size and simply weld to your baseplate and then to your spikes. Cover with a coat of paint and install. Here is a simple tool you can make yourself. You’ll need some square tubing for this, ( I would go with 2×2) and some good support brackets to hold everything in place. 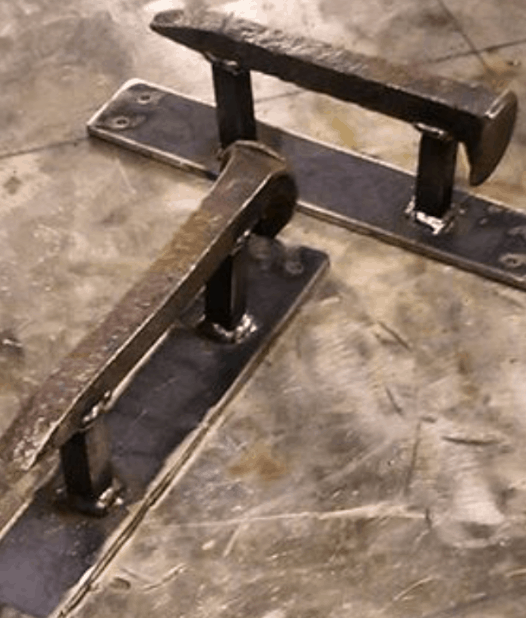 I would cut everything to size and tack weld it all together – then make sure you lay some really good beads in place ( this thing needs to support some heavy wood!) I would use a stick welder to ensure proper penetration. Once you cut your logs down to size, you’ll need something to split them for your fire. 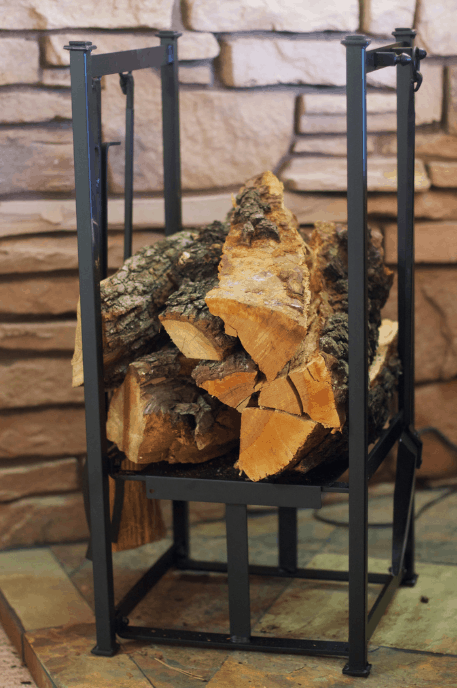 This simple log splitter is easy to make and will last a long time. You’ll need a small cut of pipe for the top to feed the log into, and the rest is all flat stock that is cut to size and welded in place. You can use an angle grinder to keep a sharp edge where the log meets the metal. A forge is a great item to have on a farm. 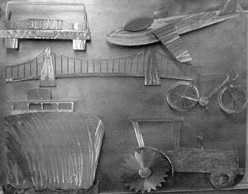 You can create beautiful metal pieces for custom designs or fabricate tools to use every day. To create a forge you will have to weld together a frame and other parts, but it’s not very complicated. This is a nice piece that adds interest to your space. A nice patio arbor is a place to gather and, depending on how it’s built, it can provide some relief from the sun. 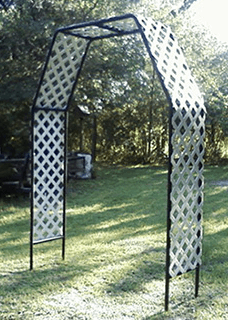 You can also build a patio arbor with different designs and as an entry point through a gate. If you’re on a farm you’ll definitely have plenty to cook! 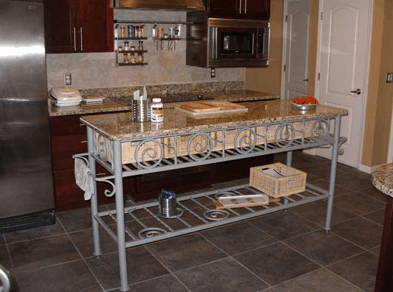 Why not create a kitchen island to hold all those tasty creations. The best thing about this project is you can create the exact size you need, with as many or as few draws for storage. You can also top the island in any material that you like. On a farm you probably have many tools to help roll bales of hay – but do you have something to help you unroll the hay? With this project, you can build a hay unroller to save you time and money when you need your hay. This unroller will help unroll whatever you need for your cattle as opposed to setting the whole bale out and letting the cattle eat what they want. Here is a nice way to enjoy the outdoors and cook up a good meal for your guests. A backyard stove is not only a good during summer cookouts, it’s also nice to warm up those chilly fall evenings. What I like about this stove is you can complete it with a MIG welder or a stick welder and have excellent results. You wouldn’t think of plant stands as something to have on a farm necessarily – but it’s a nice way to build out a gathering area for your guest. 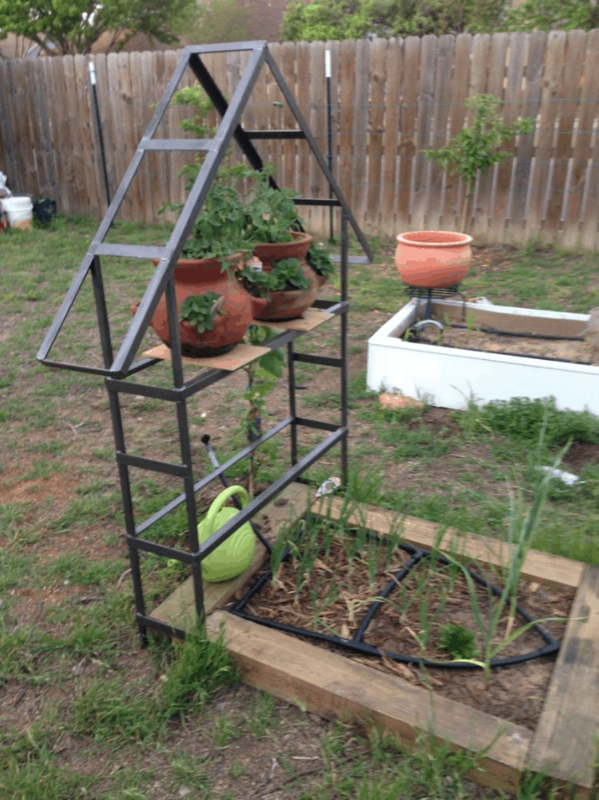 ( possibly even around your stove in #57 or you arbor in #54) Simple and easy to construct out of mild steel these plant stands can be built to accommodate any number of potted plants. 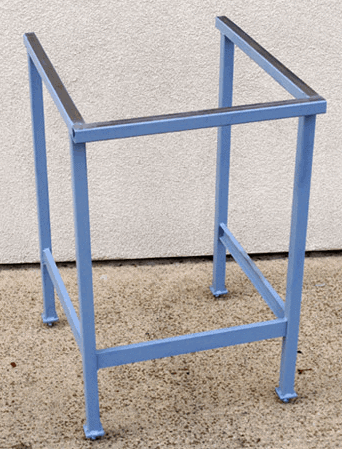 Made mostly of 1×1 tube steel these are quick to make, just remember to paint them to prevent rust! What a neat way to add a thoughtful ( and useful) addition to your outdoor space. These beverage stands make use of horseshoes, round tube ( or square tube) and some other decorative elements. 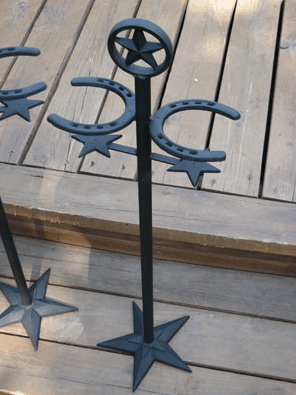 A plasma cutter would be great for cutting the stars from some scrap, but you could also use an angle grinder too. I love this project because you can not only use it at home, you can also take it to your neighbors for a cookout. Heck, you could even start a little side business if you like. 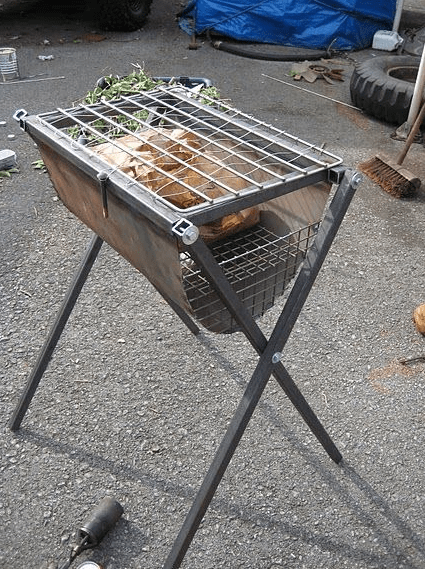 This “pig cooker” can cook any type of meat really. 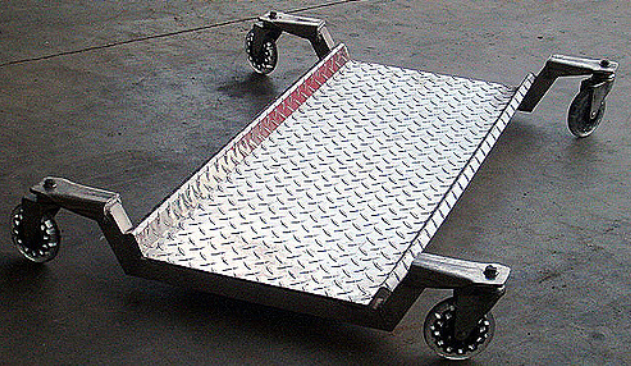 It’s made from an oil drum and mounted on a tube steel trailer for easy transport. Makes me hungry just writing about it. Tip: a plasma cutter would make this job a breeze. Here are some unique projects that you just do not see every day. Some of these projects are are a bit intricate- but the results are so worth it! This is a great table to create- when you’re done it looks so amazing. You’ll need a variety of wrenches, gears, chains, bolts and whatever other flat items you can think of. 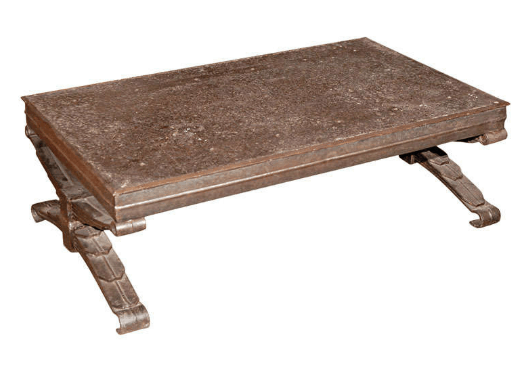 This is also nice because you can make the table as small or as large as you wish! 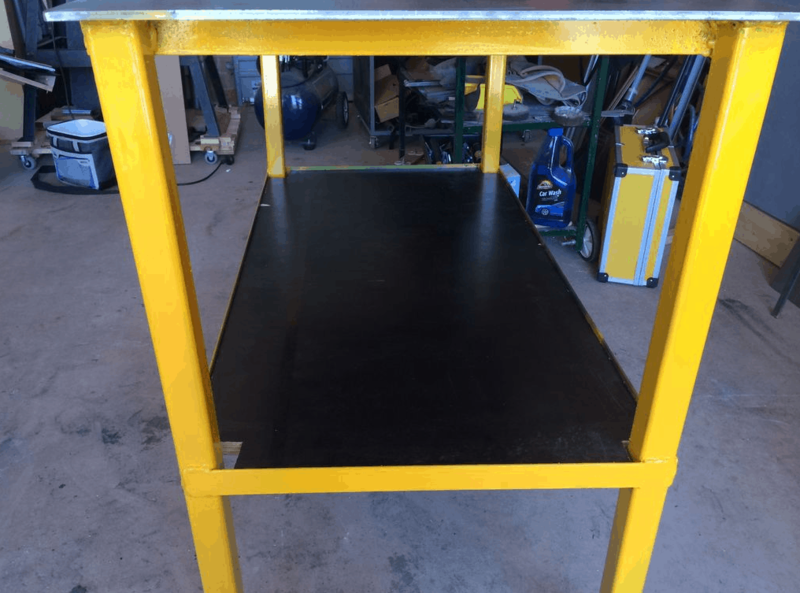 A good welder to handle this table is the Ironman 230 – it can weld the thickest material you would need in this project. 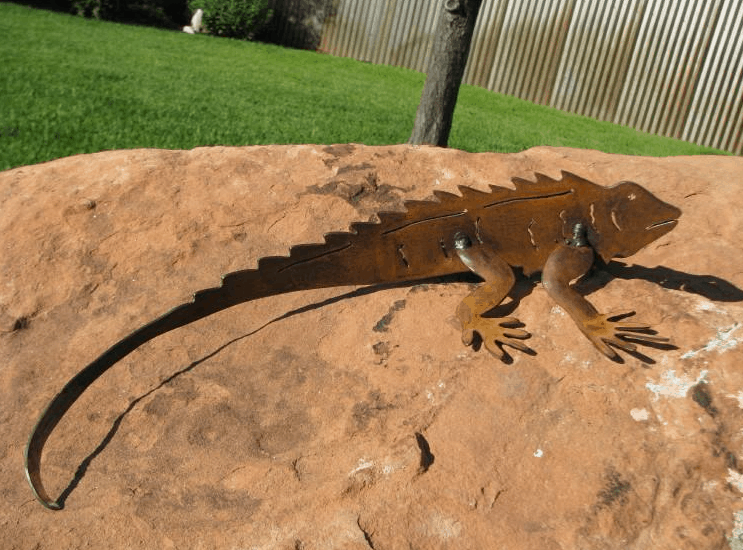 This is more on the creative side, and you’ll definitely need a plasma cutter to make your intricate designs, but the time and effort invested will result in some beautiful work. Your designs can be displayed around your home, outside your home or even in public areas for everyone to enjoy! 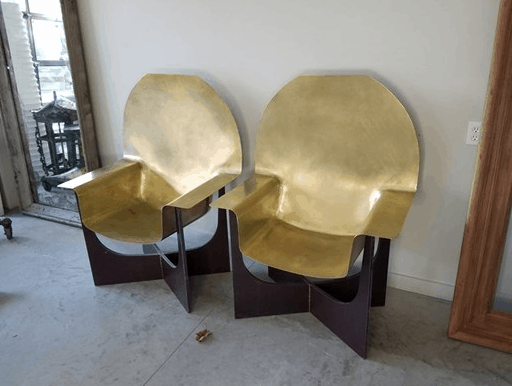 These are definitely not your everyday chairs. These are constructed with bronze, hand rolled and hammered into shape. A TIG welder was used to weld together the base material to the bronze, and the result is amazing! This is a cool way to decorate for the holiday AND use your welding skills to show off a bit! You will certainly have the coolest decorations on the block with these designs. A plasma cutter would make everything quick and easy, but other tools can be used too. Here is a really unique corner desk that was created for a specific space. I love this project because you can make it too! Just measure out your space and create a perfect fitting desk. Now you can really take it to the next level with plasma cut designs, LED inlays and the works like these guys did. I like this idea because you can really express yourself by decorating your home. You can create signs for indoor and outdoor areas where family and friends gather. A good plasma cutter would be this one here. Once your lettering is complete you can weld them to some flat bar or mount on some wood. 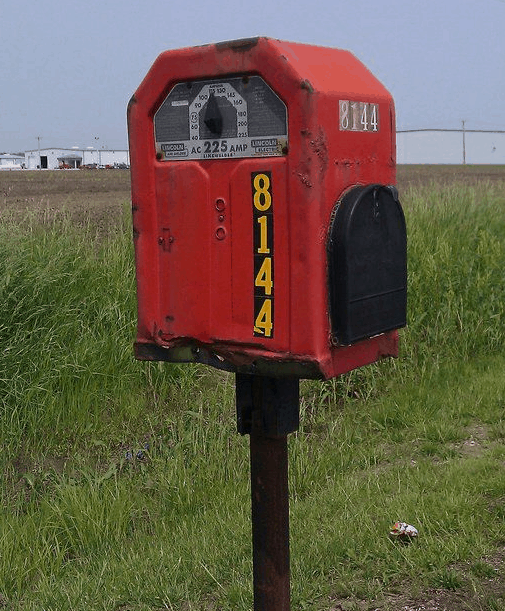 If you’re a proud welder, this is the mailbox for you. You can find a “tombstone” welder pretty cheap ( especially if it doesn’t work) and hollow out the inside. Take your welder and mount it on some solid steel tubing and you’ll have a unique mailbox. What do you get when you mix a welder and some classic car parts? 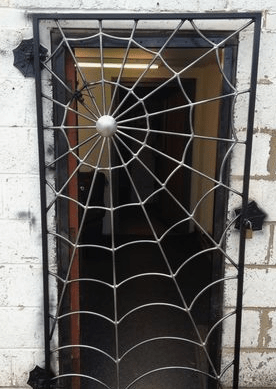 A cool gate that’s sure to impress! If you have access to a junkyard you can definitely find some used parts to make yourself a gate that’s functional and cool looking at the same time! This project requires some tube steel and some poles, other than that I would use a stick welder to ensure everything stays together. What if you don’t like the traditional truck tool boxes that sit in the rear of your pickup bed? Well, you can fabricate one that swings out! This requires only mild steel, some MIG welding and a joint that separates. This is one unique way to protect your home or business. You’ll need some round stock solid metal or rebar, your choice. Then some tube stock for the outside frame and a bender to create the webs. Simply assemble and MIG weld in place! If you recall, in #15 we mentioned you can make furniture frames. Well, in this project you can break them out. 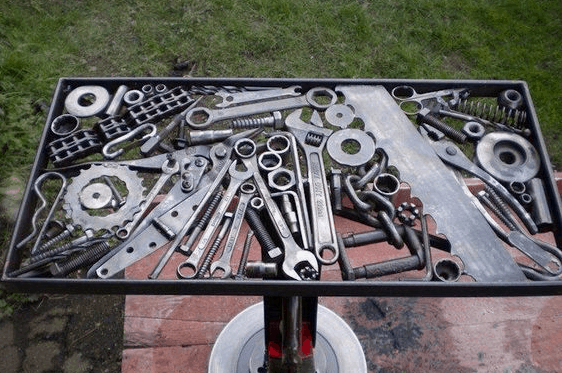 Since you already welded the legs together, you simply would use some bicycle chains and gears to make a super interesting table top that is sure to be a topic of conversation. I would create a gear in each corner and when complete you can bolt the table top to your legs and your project is complete. 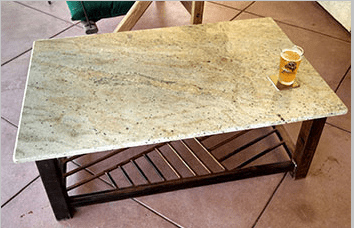 This is a vintage table I found that you can easily make on your own. You’ll need some truck suspension leaves ( two sets, 4 total) and a solid steel – probably ⅜ inch would work- top. You’ll weld the leaves together using a stick welder, then weld the leaves together to create a base. 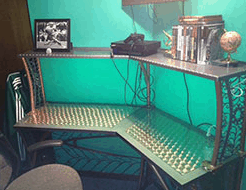 Repeat the process and then you can mount your steel top to complete your new desk. 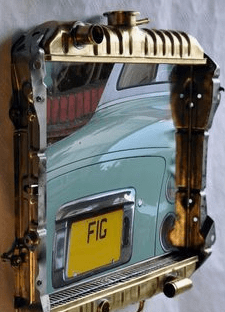 This frame makes use of used car parts, but you can use anything you imagine. Just remember if you use car parts ( especially today’s cars) a lot of them use aluminum, so you’ll need a welder with a spool gun for that. This would satisfy any care lover for sure! 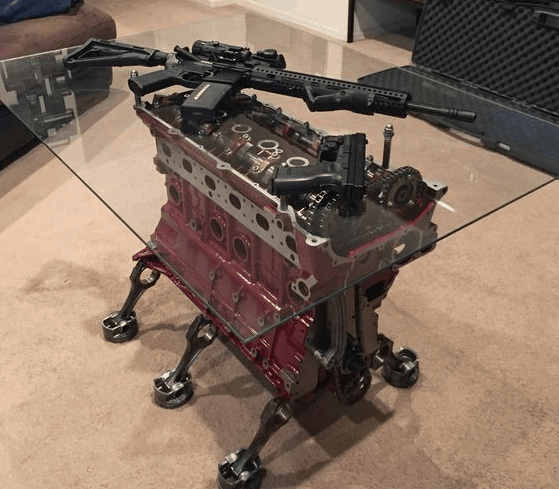 This table lets you see into the engine itself by removing the pistons. The pistons are then welded to the bottom of this engine block to support the table itself. A glass top covers everything and completes the table. Since the engine block is thick, I would use a good stick welder for penetration and plasma cutter to remove any working parts you want to show off. A good combo tool would be this. 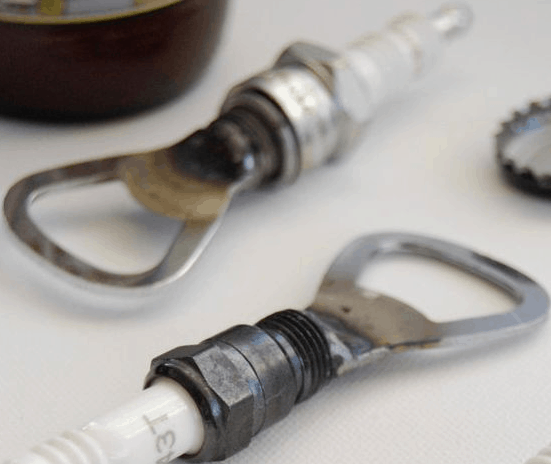 I bet you never thought you would have a use for those old, used spark plugs every again. Well, if you have a plasma cutter you can cut out a bottle opener from a mild sheet and tig weld it to the bottom of your spark plugs. It’s a unique gift that a car-loving enthusiast would appreciate. 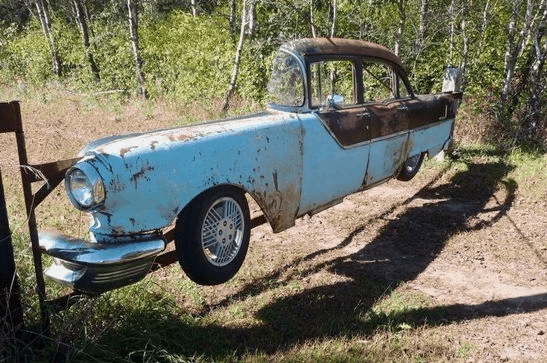 This is just like yard art, but with a nod to car lovers. 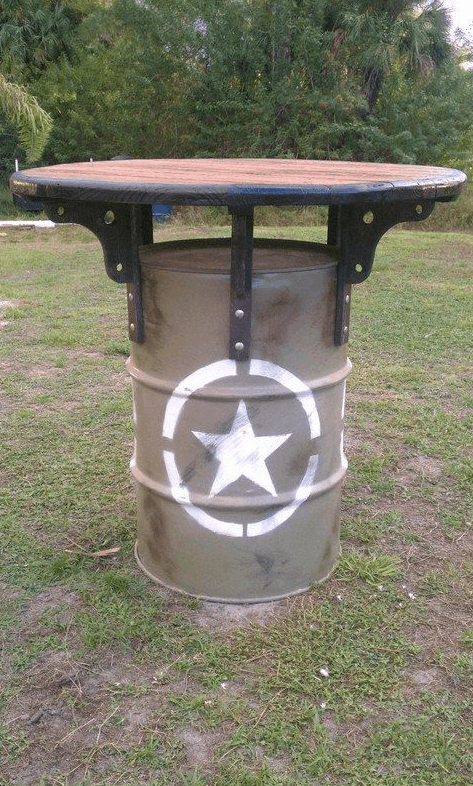 Depending on the scrap that you can source, you can make all kinds of cool designs. Most of the mild steel you can MIG weld, but some of the thinner pieces you’ll want to TIG together. 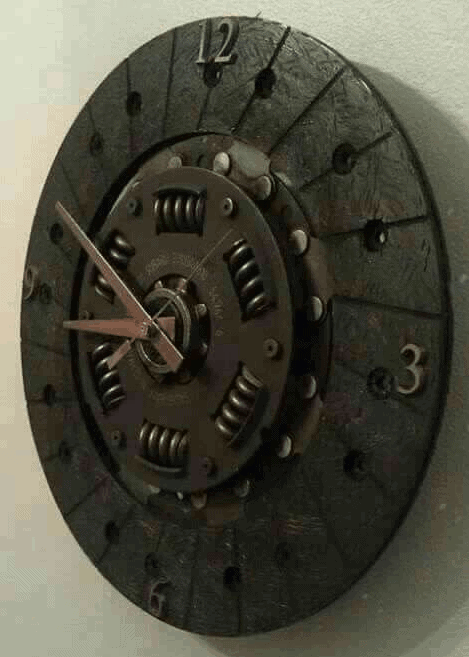 Here is a cool clock that you can make out of worn out car parts. You can use the inside of a cheap clock and make an amazing frame for it, and some small tack welds will hold it all together. This is a quick project that would make a nice gift or a unique addition to your home. I like this project because it really lends itself to using scrap. You can create something totally unique and special with whatever material you source. You can mix the materials or keep it all the same for a unified look. 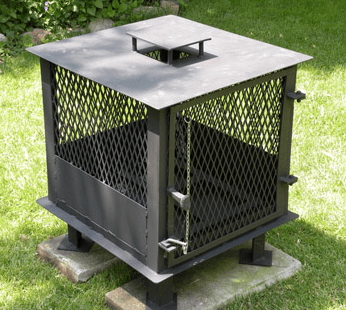 This is a great way to turn some steel tube and some steel poles into a great little stove. 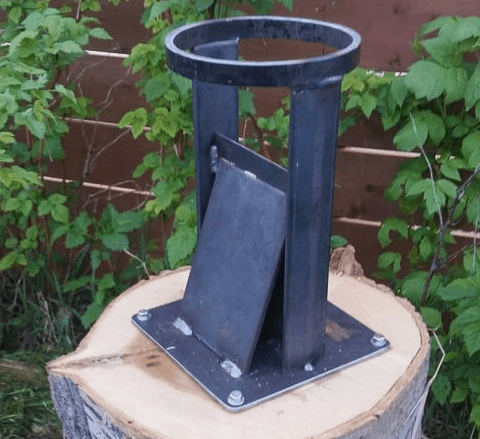 The rocket stove can be made in under an hour and is great for compact areas. This stove bolts right to the ground and can get really hot ( makes cooking a breeze). A combo tool is used to create this stove. I found this video and was amazed at the quality of the flowers made – and all from scrap. With a little MIG welding, some paint and some imagination, you can create some beautiful flowers for your yard year round. Sometimes you get some really small pieces of scrap that you think you just can’t use for anything. Well, in this video we see the artist MIG weld a skull from all her small “scraps” of steel. Since there are very small, a good welder would be the Hobart 140. We made a nut bowl earlier in #7, but that was using brand new nuts. You can easily source used nuts from a builder or recycler. Now, with a bit of cleaning using a product like this, you can build a really nice stool using scrap bolts and tube steel. This is a great project because you’ll have all your material collected in no time at all. SImply collect all the tubing scraps you can get, and weld them into an interesting shape for inside or outside your home. If your going to display your art indoors, I would belt sand the edges so they are friendly. 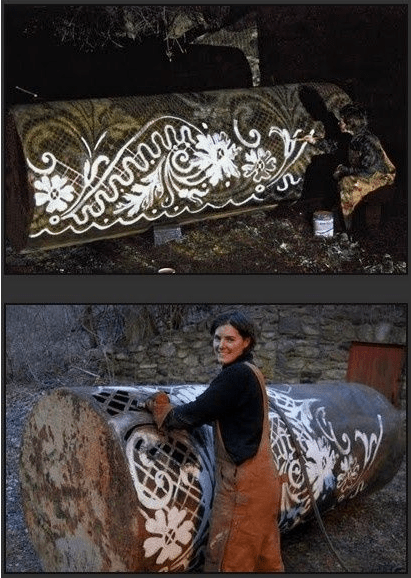 You can paint your creation or let it develop a rusty patina – your choice! In this article, we showed you over 83 unique projects that you can make. Some are easier than others, and some require a little more planning to execute. Whatever project you choose you’ll be sure to build something pretty cool.